A 10-minute daily sketch is a great way to start the day, keep my sketching skills up to speed, and experiment with line and color. Every piece is unique. They are available at my Etsy Store priced at only US$60 each and 50% of the proceeds are donated to African conservation organizations. I begin each one with an ink drawing then add watercolor or fluid acrylic if time allows. These daily sketches began when I attended a Portrait Party organized by New York City Urban Sketchers. There were nearly 100 artists, divided into groups of 12 and we sketched each person in our group, one at a time, for 10 minutes. I enjoyed this experience so much that I continued doing a 10-minute portrait sketch every day after that. Soon I decided to revert to my usual African subject matter as I realized this would be a great way to keep my sketching skills up to speed for when I return to Africa and sketch animals from life. As my daily sketches started accumulating I decided to sell them on my Etsy Store, with 50% of the proceeds donated to the African conservation organizations I support. These include African People & Wildlife (Tanzania), Painted Dog Research Trust (Zimbabwe), Cheetah Conservation Fund (Namibia) and others. My daily sketches are based on the amazing photos taken over the years by my husband, Nigel. Working directly from photos is not normally something I do, but when I set a 10-minute deadline I have to concentrate on the basics and eliminate unnecessary detail, just like I do when I’m sketching from life in Africa. Every sketch is unique, priced at only $60 and 50% of the proceeds are donated to African conservation organizations. I’ll be posting new pieces to my Etsy Store every few days so please join me for my 10-minute daily sketch journey! See my husband, Nigel’s photos on Instagram. Visit African People & Wildlife website. Visit Cheetah Conservation Center website. Visit Painted Dog Research Trust website. Visit NYC Urban Sketchers Facebook Group. This entry was posted in 10-Minute Daily Sketches, Acrylics, African Wildlife, Big Cats, Blog Posts, Conservation, Elephants, For Artists, Ink, Painted Dogs (African wild dogs), Watercolors and tagged antelope, daily sketches, elephant, leopard, painted dog on April 16, 2019 by Alison. I recently conducted a survey and asked what everyone would like to see more of regarding my art and travels. One request was for more works in progress, and for more about the inspiration behind my paintings, so here’s a brief video about my new leopard painting. It includes the initial inspiration, thumbnail ideas, composition and stages of the painting. It is difficult to video my work as it progresses, because I paint flat on a table. This means I have to place my video on a very high shelf and try to remember not to block the view when I am painting. Not ideal, but I’m gradually improving my video techniques, so watch for more soon. If you took part in my survey – Thank You! You can see all the results here. If you haven’t completed the survey yet, you can do so here. This entry was posted in Acrylics, African Wildlife, Big Cats, Blog Posts, For Artists, Workshops and tagged acrylic, leopard, studio, video on March 13, 2018 by Alison. 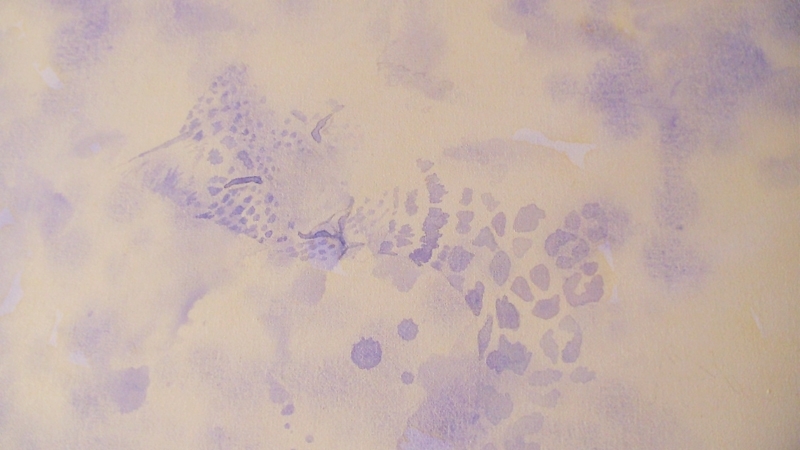 My first attempts at painting this leopard in acrylic didn’t start well. I soon found myself painting too much detail, painting too many spots and rosettes and whiskers. It is certainly easy to get distracted by detail when painting such an exquisitely marked cat, but detail was not what I had in mind. A new start was needed, and a bolder approach. Here is the final result – a painting I’m thrilled with. It certainly knocks the spots off my two previous attempts!! This entry was posted in African Wildlife, Blog Posts, For Artists and tagged acrylic, Africa, leopard, nicholls, painting, wildlife on March 31, 2015 by Alison. I was hoping I would have finished my leopard acrylic today but its not quite ready yet. But even so, I thought I’d show you the update. In my last post I showed the initial studio drawing and a watercolor. 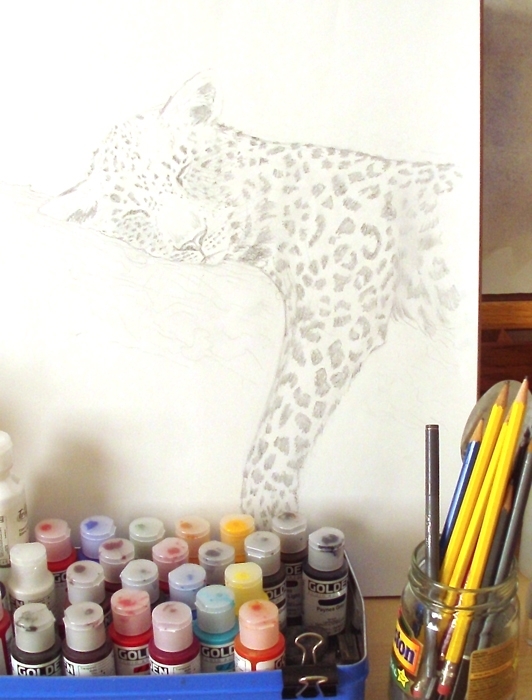 Now I have drawn the leopard the actual size I plan to paint him (below). Then I’ve started with several washes of color – naples yellow then ultramarine blue. This is a night scene so I don’t want the leopard to be too obvious, I want him dozing a little after a meal, camoflaged among tree branches and leaves. Next time I hope to show you the finished piece! This entry was posted in African Wildlife, Blog Posts, For Artists and tagged Africa, African leopard art, Alison Nicholls, art, conservation, drawing, leopard, leopard painting, painting, wildlife on February 20, 2015 by Alison. It was my Dad’s Birthday recently and he asked me for a watercolor sketch. All the watercolor sketches you see on my website are ‘field sketches’, which means they are created in Africa, on site, without reference to photos or video. But what I was painting for my Dad was being done in the studio, so I decided to make his watercolor the basis for my next studio acrylic painting. First I created a small pencil drawing (above). Then I painted the 14×11″ watercolor (above). In my next post (Friday) I’ll explain how I use this watercolor as the basis for a 20×16″acrylic painting. 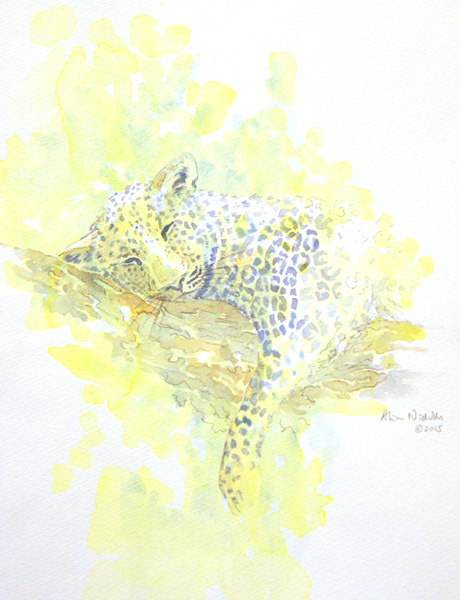 This entry was posted in African Wildlife, Blog Posts, For Artists and tagged leopard, watercolor on February 17, 2015 by Alison. In answering the question with a resounding “Yes”, I have tried to explain the size of the African continent and the huge distance between West Africa, where the Ebola outbreak exists, and the safari destinations of East and Southern Africa. As the crow flies, London is actually closer to West Africa than Nairobi in Kenya! It is very easy to find alarmist reports in the media wherever you are in the world and the other day I received an email from a friend in South Africa who was concerned about my husband traveling into New York City for work because she had heard of the healthcare worker here who had been infected while working in West Africa! Tourism is vital to the economies of many African countries and plays a large part in ensuring the continued existence of wildlife and wild lands. If you value this and want to help both the people and wildlife of Africa, please think very carefully before canceling your travel plans to the continent. Consult your travel agent by all means, but remember that the main safari destinations of East and southern Africa are literally thousands of miles away from the outbreak in West Africa. Before I end I do want to say that Ebola is a terrible disease and my thoughts are with the people of Sierra Leone, Liberia and Guinea who are caught in this outbreak. The dedicated healthcare workers from these and other countries are heroes and should be treated as such. I hope that the outbreak can be controlled quickly without the loss of more life. Ebola on Safari? I Think Not! When I arrived in Africa in 1994, I was keen to see as much wildlife as possible, but their tracks (or spoor) were a complete mystery to me. I soon found out that a cat track has 3 lobes on the back of the large pad – perfectly displayed in this photo of a resting leopard by my husband Nigel Nicholls. I knew I would forget this piece of information so I made up this little rhyme “one, two, three, cat up a tree” to remind myself. Even though I don’t need the rhyme anymore, it still pops into my head whenever I see a cat track! I am guessing I’m not alone in trying to find ways to remember information. Any second now this leopard will get up and cross the dry riverbed. Any second now I should get up, go across the hall to my studio and see if my latest wash of paint (lemon yellow) is dry. 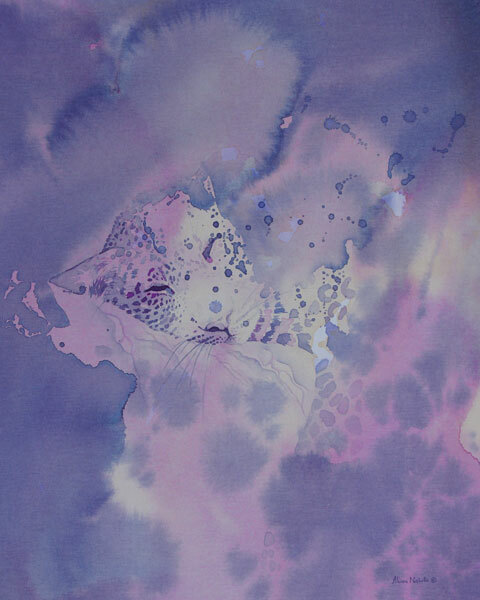 I’m working on a different spotted cat at the moment – a cheetah! During my last trip to Mashatu Game Reserve in Botswana I saw numerous leopards. The only problem was that I wasn’t feeling great, having had a terrible cold for about a week, so sketching was not going incredibly well. But here is a sketch I managed to do in between sniffs! 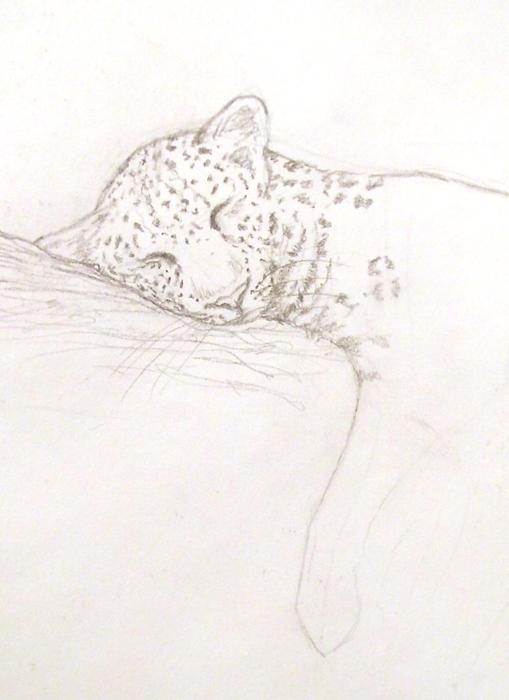 I find leopards one of the more difficult cats to sketch. They don’t have the bulky muzzle of the lion or the more delicate, angular head of the cheetah, both of which allow you to instantly identify the cat from a sketch. Often, with a leopard, adding the spots makes all the difference (as you would expect). The trouble is that often I only have time to sketch the outline of the cat before it moves off, which means no time to add spots. So when I see a sleeping leopard I’m very happy. My photographer husband was less happy because this leopard had a single thin branch crossing her face and ruining his photos. That’s where artistic license comes in very handy – you’ll notice there is no branch in my sketch!